Resume Template 3 is a style that can be useful to applicants that need help filling in the page because they don't have enough real content to write. For job seekers freshly out of school or someone that has been at the same job for many years you probably won't have much of a job history to write about. To help take up space the sections have lines above and below the headings that by design tend to occupy a lot of space relative to the headings in our other styles. These heading titles use a larger font than the rest of the page and are also bold face. The applicant's name is first on the page at the top center and uses the largest font and is bold face. The Education and Employment sections have the job titles and degrees in the center of the sections in bold. The dates are set to the right and the company name, school name and cities are set to the left. The contact area places the name at the top and divides the rest of the information between the left and right sides. The street and website addresses are on the left. The telephone numbers and email address are on the right. 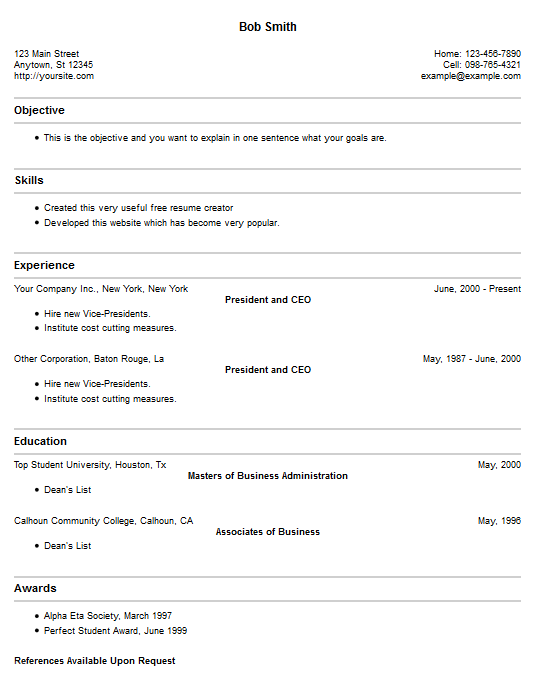 Download this template from our free resume creator, then learn how to write a resume.